This is the perfect vegan hamper for the cook in your life! 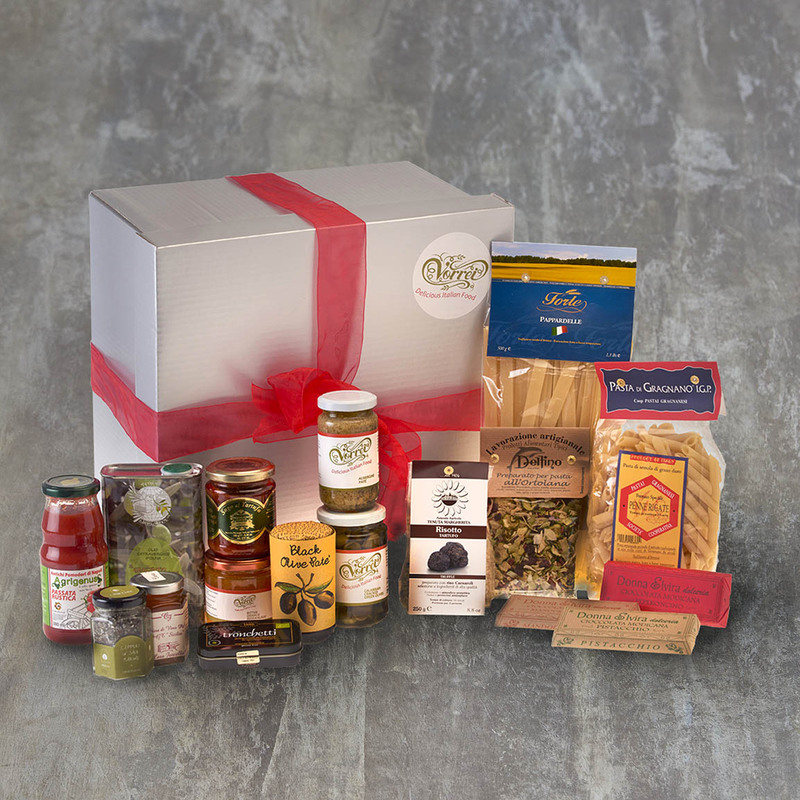 We have brought together a selection of our most popular Italian vegan ingredients as well as some indulgent treats and presented them in a lovely silver box, tied with a large red ribbon. Slow Food Napoli San Marzano Tomato passata (380ml). Made from the world famous San Marzano tomatoes, this passata is perfect for making a delicious pasta sauce. Extra virgin olive oil in a handy can (500ml). Giovanni Marvulli’s 'Cenzino' extra virgin olive oil from Matera, Basilicata is both healthy and full of flavour averaging almost three times the polyphenols of typical extra virgin olive oils (see our chart below). A certified organic oil, fruity with a distinct almond after taste and an elegant aroma, wonderful on salads, cooked vegetables, fish and seafood or simply drizzled on your crusty bread or bruschetta. Lemon mustard from Mantova (120g). This fruit mustard is made in Mantova, Northern Italy with fresh lemons and a few drops of mustard oil to give a perfect balance of sweet and spicy. It goes really well as an accompaniment to mature and strong cheeses. Tomato sauce with truffle (180g). Made with black summer truffle and best quality natural ingredients, this sauce will give a luxurious finish to any pasta dish. It goes really well with our Pappardelle pasta also in this hamper. Pantelleria capers in sea salt (90g). Our capers have IGP status (Protected Geographic Denomination) and come from the Sicilian Island of Pantelleria. They are said to be the best capers in Italy! Crunchy and full of flavour, they are a great addition to salads and sauces. Calabrian cracked green olives (314g). These slightly spicy, crushed olives from Southern Italy have a bold flavour making them ideal as a tasty antipasto. Mild chilli pepper paté (180g). Made with spicy Calabrian chilli peppers, olive oil and a little garlic, this spread is wonderful on a bruschetta or cheese biscuits. Bitter orange marmalade (250g). This popular marmalade is rich in fruit and made exclusively with Calabrian oranges that give it a delicious bitter sweet taste. Organic Liquorice Tronchetti (40g) Made from organic Calabrian pure liquorice. Ready made risotto mix with crougette and saffron (250g). Made with superfine Carnaroli rice, this is a tasty and easy to prepare meal. Just add some olive oil and follow the simple instructions. Hand made bronze die cut Pappardelle pasta (500g). This artisanal, hand made pasta is traditionally served with rich sauces. Hand made bronze die cutFusilli pasta (500g). Our fusilli pasta are spiral shapes which go well with cheesy and vegetable sauces. This textured pasta retains its shape whn cooked and sauces cling nicely to it. Ortolana dried pasta sauce mix with aubergines, courgettes and pumpkin (50g). Make a delicious pasta sauce in minutes with this handy mix, just add tomatoes and olive oil! Dairy free Modican chocolate with Avola almonds (100g). Made in Modica, Sicily following an ancient Aztec recipe, this unique, crumbly chocolate bar is a must for chocolate lovers! It's free from cocoa butter and animal fats and has an intense almond flavour. Dairy free Modican chocolate with chilli pepper (100g). A cheeky chilli flavoured crumbly chocolate! Dairy free Modican chocolate with Bronte pistachios (100g). Dark Sicilian chocolate with sweet Bronte pistachios in every bite. Please note that if there any items out of stock, they reserve the right to substitute it with the most similar available item.